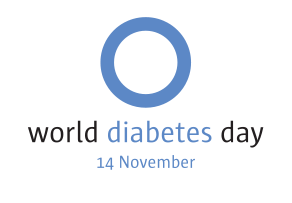 World Diabetes Day is November 14th and every year on this day the purpose is to raise global awareness about diabetes. It’s a great time to not only raise awareness of diabetes, but for health-care professionals to show their commitment to the patients they serve who are living with diabetes. On this day, the diabetes community across the world conducts a campaign aimed at providing diabetes related information to prevent the disease as well as reaching out to the millions with diabetes. According to the World Diabetes Foundation some 285 million adults live with diabetes worldwide as of 2010, roughly 6.4% of the world population. And that number is expected to balloon to 438 million by 2030, which is about 7.8% of the adult population. That number is even higher in the U.S. with roughly 8% of the population, which accounts for around 26 million people, who are affected by diabetes. And that number is expected to double or triple in the coming decades. It all comes down to education. Education is more important than ever to prevent or control the disease. Type 2 Diabetes, which accounts for about 95% of the diabetes cases really comes down to lifestyle. There is no doubt, a direct correlation between increased sedentary lifestyles and poor nutrition and the increase in the numbers of people affected by type 2 diabetes. Having said that, this makes World Diabetes Day a great time to educate and raise awareness around diabetes. In fact, the entire month of November is Diabetes month here in the United States. And numerous organizations have been actively encouraging people to get screened for diabetes. As well as teaching people how to prevent diabetes or reduce the risk to long-term complications from diabetes. Since type 2 diabetes is affects the majority of the people with diabetes, it is important to have the right programs and resources in place to help educate people. Type 2 diabetes can be controlled or prevented. But without the right information, the numbers of people affected with diabetes will only continue to rise. Many issues, such as cultural, emotional, or lack of knowledge all play a key role in this equation. In my opinion, perhaps the most controllable of all is knowledge or education. At the end of the day, “you DON’T know, what you DON’T know.” But once you DO know, you can make better choices, which will ultimately create a better outcome in the future when it comes to diabetes.